Lets be real… How many vegetables are you truly eating per day? I am not talking about the piece of lettuce or tomato on your sandwich either. I mean cups of leafy dark greens, bright oranges and reds, deep purples and yellows. According to the CDC Only 32.5 percent of the population eats two servings of fruit daily and the stats of eating vegetables is even worse; only 26.6 percent of Americans are eating three servings of veggies per day. We need to be eating at least NINE servings a day! What are we filling up on? Refined carbohydrates that have absolutely no nutritional value, less than ideal protein sources, processed foods and more processed foods. I mean it is really no wonder our country is so sick! We need real food. Vegetables and fruit provide our bodies with the nutrition it craves. The more nutrition you provide your body, the more satisfied you are, the less cravings you will have. That is one reason we like Green Smoothies so much in this house. 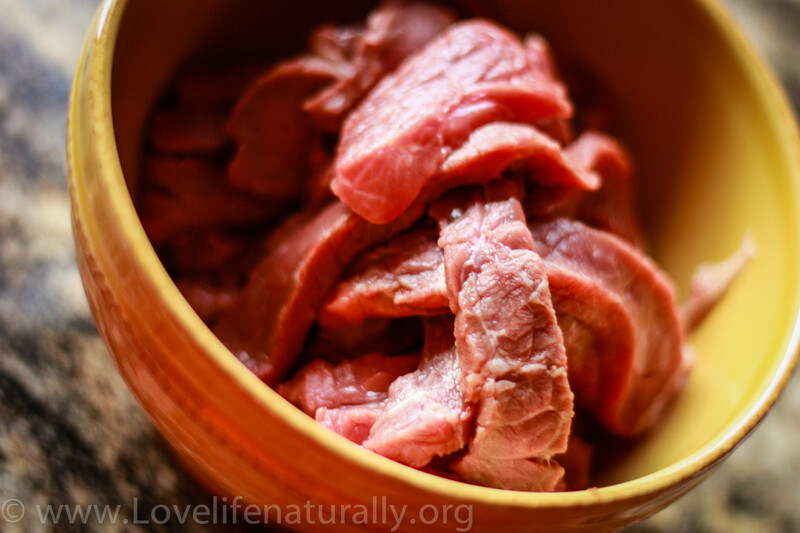 They are packed full of vital and alive nutrients! 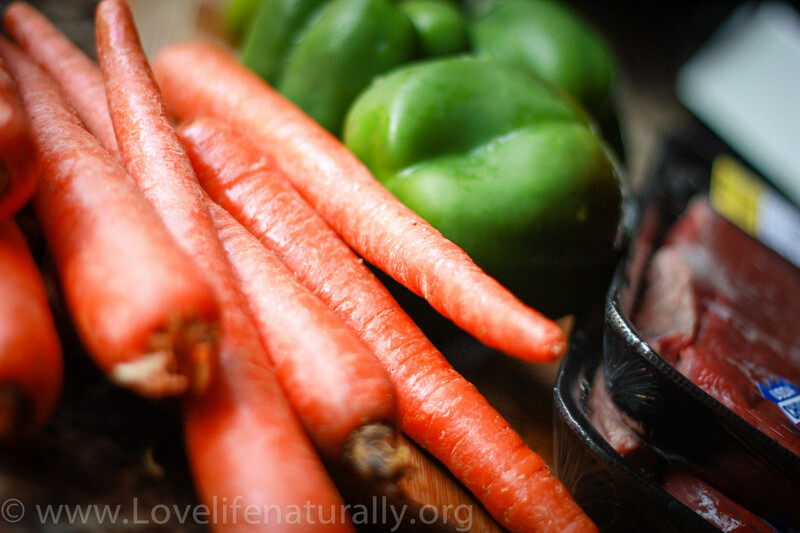 Fruits and Vegetables are God’s gifts to us to fend off disease and sickness… and people aren’t eating them! So many of us are eating the wrong foods and then wondering why they have high blood pressure or diabetes. We rely on prescription medication to fix the problem when ultimately we are just putting a band-aid over the real problem, our diet. We need to start providing the right foods for our families. We need to be their health advocates and teach our kids the importance and value of REAL FOOD, nutrient dense powerhouses that are going to prevent disease! Our government and school systems sure are not doing that. Health starts at home, in our kitchens. Lets get back to the basics, let get back to good old fashion home cooking, and change the direction this country is heading! 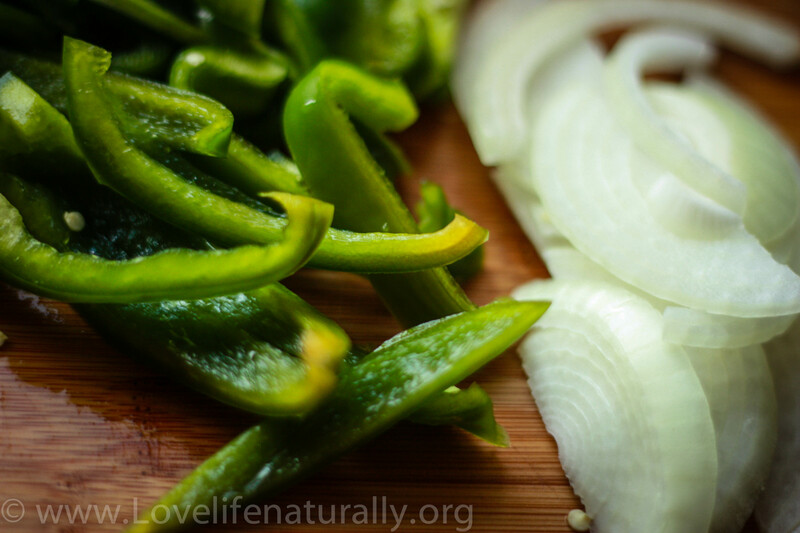 Wash peppers and slice into long strips along with the onion. 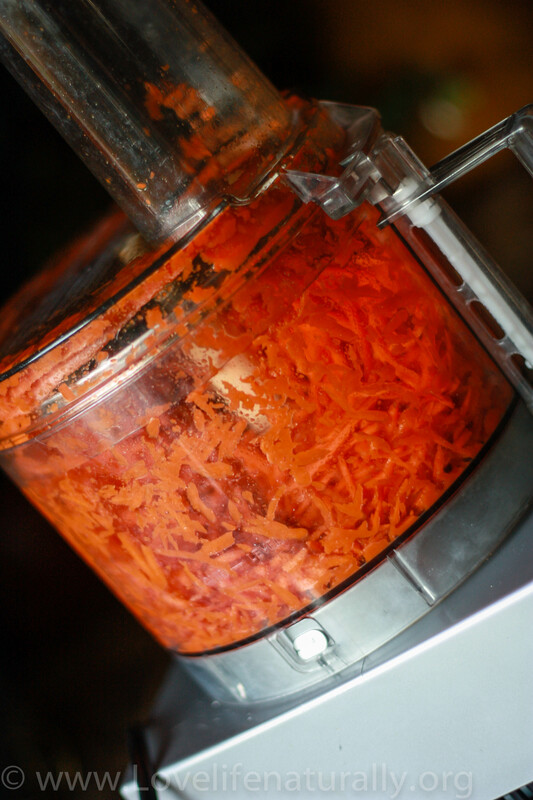 Shred carrots. My food processor is the easiest and I highly recommend purchasing one if you do not have one! Heat pan and melt coconut oil over medium heat. Once it is hot, add onion and beef. Sauté for three to five minutes or until onions are slightly translucent. 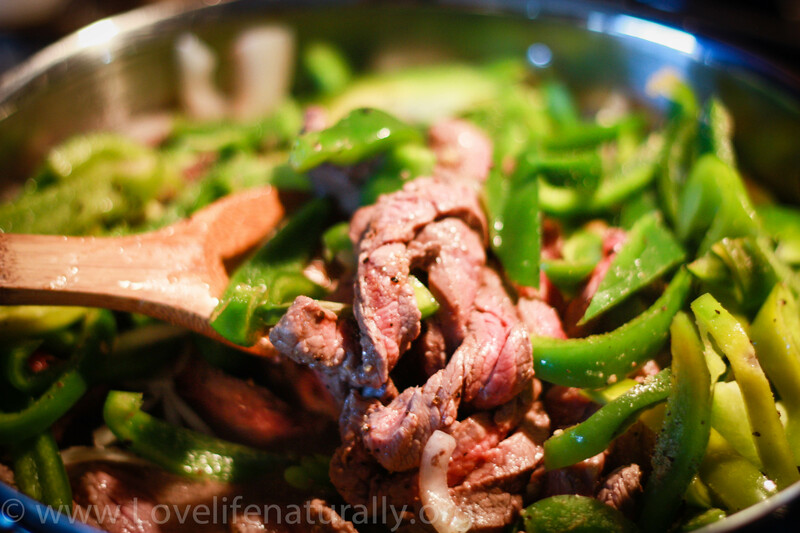 Add bell peppers, water, garlic powder, salt and pepper. Cover and occasionally stir for 5 to 7 more minutes. You want to peppers cooked, but still crisp. 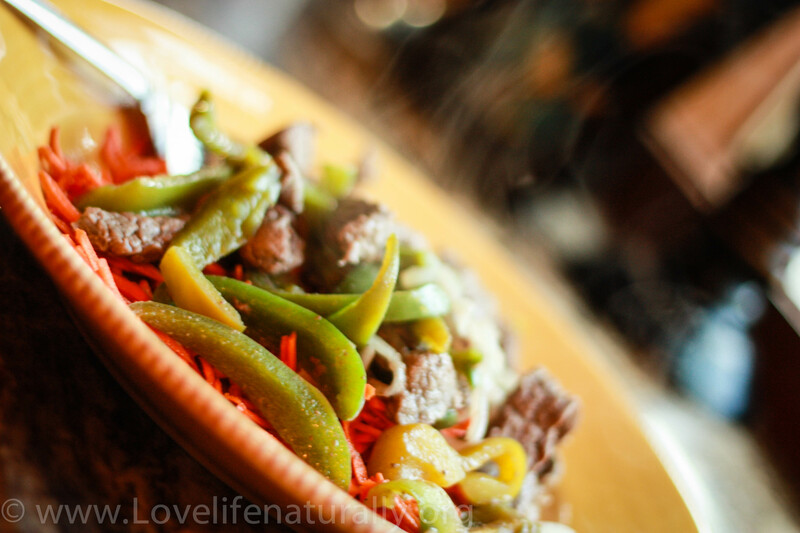 Place a serving of carrots onto a plate and then add some of the peppered steak on top. Enjoy! It makes a beautiful presentation. This meal is full of healthy fat, protein, and complex carbohydrates to FEED your body what it truly craves. It is simple. Fill up on healthy vegetables, fruits, healthy fats, and quality protein. Live a quality life, one that the Lord created us to live, one that is healthy, one that is whole. Haha oops! It’s powder! Thank you for noticing that! I will correct 🙂 let me know how it turns out! Hi! I’m just wondering about the steak getting tender enough. Every time I make things like this, it’s tough 😦 What do you think? Thanks!! 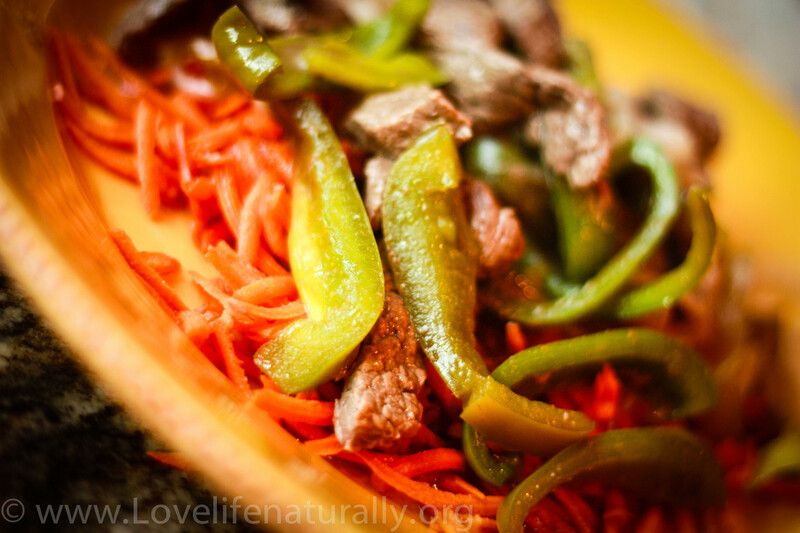 My husband is not a carrot eater, could you use spegetti squash instead of carrots for the peppered steak receipe. on your peppered steak receipe, my husband is not a carrot eater, so could you speghetti squash instead of carrots.